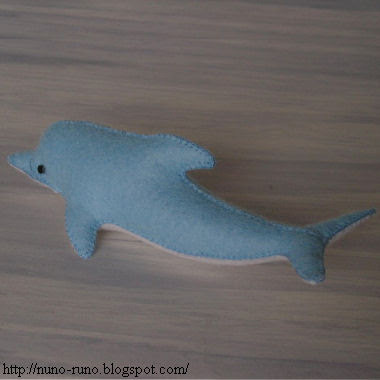 Stuffed dolphin of felt. 13 centimetres. 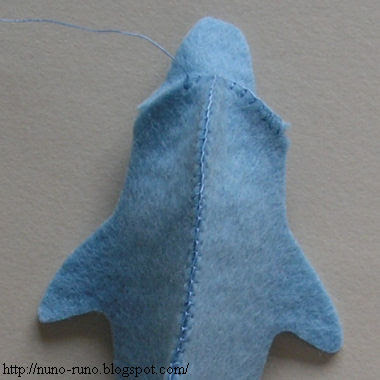 Sew up the back with blanket stitch. Sew the upper jaw to the face. Sew the belly to the body. Stuff polyester fiberfill in it. Glue the eyes. Eyes are small circles of leather. You may use beads. Its lower jaw is shorter (use green line of the pattern). 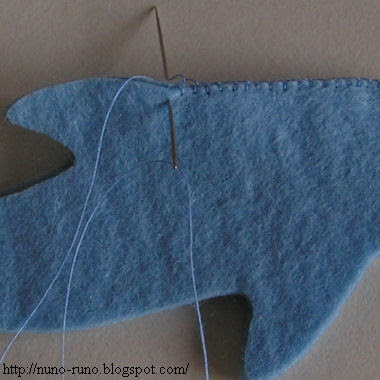 Sew the dart of inside mouth. 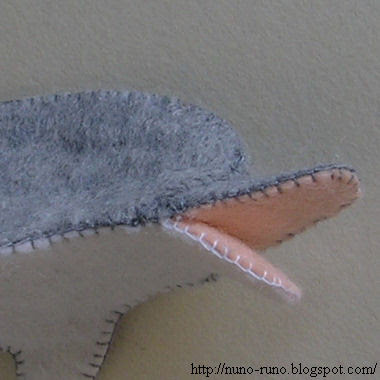 Then sew the inside mouth to the outsides. Baby dolphin. I printed the pattern in 50% size. Amazing as usual, Runo! I absolutely adore all your patterns and came on here to get the bird one to make for a friend, only to fall in love with the dolphin! Your dolphins are lovely! Thank you so much for sharing the patterns - I can't wait to make one! Thank you for the patterns of the beautiful dolphins. Your website is always fun. I like your blog, is beautiful!!!! Runo, thank you for sharing your wonderful patterns with those of us who aren't as creative as you. They are so great. 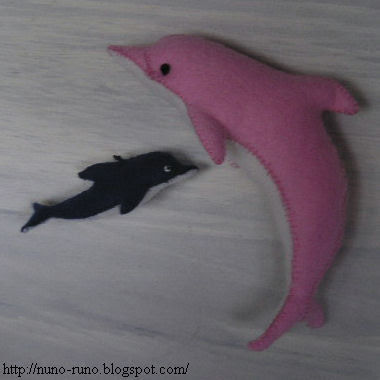 I made one of your small cats and two dolphins, one out of felt and one out of fleece. I love them both. I am giving them to my niece who wanted a stuffed dolphin for her birthday. Thank you thank you. Thanks for sharing patterns here, Runo. 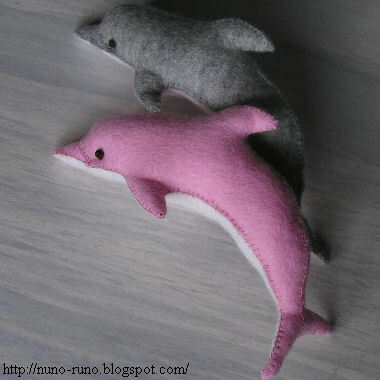 I just tried to make some little dolphins for my niece, and will try to make another. Thank you. Piękne rzeczy tworzysz, będę zaglądać. Thank you. 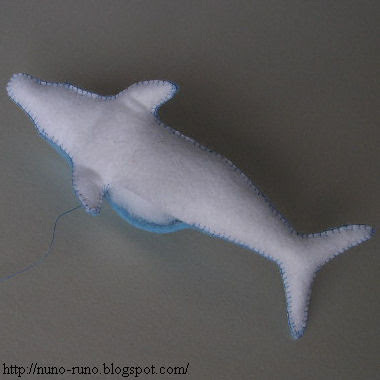 I took the pattern as my grand daughter wants a stuffed dolphin for her 7th birthday next month. I appreciate your giving this for free. This is such a great pattern! Thank you! 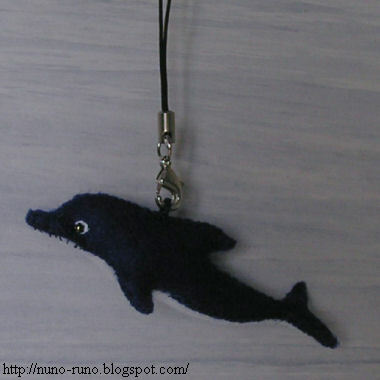 I enlarged the pattern and made a bigger dolphin using denim from an old pair of jeans. I love it! I love your site. Your work is beautiful and absolutely awesome. Thank you so much for sharing your wonderful talent. Nunio!!! You are Queen of the Dolpinzzzzzzz!!! We love you Nunio - we are making a dolphion hand puppet - do you have any advice so we can adapt the pattern and squeeze a hand up into the doplin? Don't ever stop Nunio!! 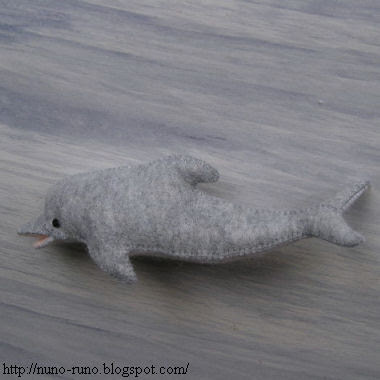 me and my mom are making these adorable dolphins. just finishing up. 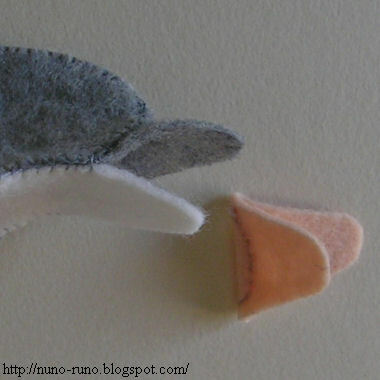 they are very fun to make.I am going to give them to my friends for party favors at my dolphin party. Thank you so much, my best friend want one of these for her birthday and I think this would be perfect for her. I totally love your blog, you are so talented! I love your dolphin! 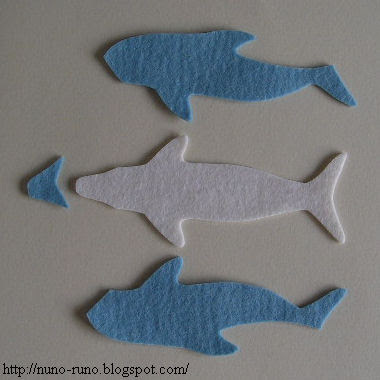 My daughter and I will make some from your pattern to go with our handmade mermaid dolls. Thank you soooo much for your talent and generosity!! love, Jzin from Costa Mesa, Calidornia. This pattern looks great! My nieces just went to an aquarium and are obsessed with dolphins- I think I'll give this a try! Thank you so much! My daughter needed to make a model for a school science project & this will be perfect! i made one and it turned out amazing!!! The directions werent perfect and i had to kind of tweak a lot but it came out great!! I even made a fish for his open mouth!!! so cute!!! Thanks runo!! it is awesome! i'm making one right now! Perfect! I am visiting a friend who's daughter is in the hospital and she loves dolphins. Funds are tight right now so I thought I would have to show up with just a card. Now thanks to you I will have something to bring her. :) Cheers! Thank you! I used your patterm and it's great, the dolphin turned out so cool! Thank you! My son is making one for her sister. Very clear instructions and lovely dolphins, thank you for sharing. Thank you so much for teaching me. I LOVE these little guys. I have always wanted to make something like this. You are very generous, and clever, and you gave a great sense of character.